The question isn’t what you’ll be doing during the Super Bowl, you already know that come kickoff time you’ll be seated squarely focused on the big game if you’re a NFL football fan. The only question is where you’ll be watching. If you happen to be on vacation in NYC, here are several options to consider, whether you prefer the comforts of your own personal viewing or are eager to find yourself adrift in a sea of crazed football fans. For some people, watching football is as much of a team sport as football itself. Kickoff is usually at 6:30 p.m. EST, but most viewing parties (and their open bars, if they have them) will start at least a half an hour before, so be sure to get there early to claim a table or call ahead with reservations. If you’re in NYC, bars like Clinton Hall, Tir na Nog, and Wogies Bar & Grill are all showing the big game. However, battling it out for a seat at the last second on Super Bowl Sunday is not for the faint of heart, you’d best to leave the tackling to the players. If your fridge is fully stocked and the beers are cold, there’s no reason that the game can’t come to you. NBC will be broadcasting the Super Bowl this year, beginning their pregame coverage at 12:00 PM EST. If you’re in New York City, simply turn on channel 4 and let the festivities begin. NBC will be offering a full 11 hours of free Super Bowl streaming on NBCSports.com. Head over to the site and enjoy the added benefits of game analysis, features, replay videos, predictions, and Super Bowl news between plays. Why not? It’s 2018, after all. If you have Apple TV, Amazon Fire, a smart TV or Roku, you can use the NBC Sports app to view the game via your iOS or Android. The NFL Mobile app and Yahoo Sports app also offer good options for watching on your phone, if things get desperate. Not into the sports bar scene, but need someone to high five when your team scores a touchdown? If you’re lucky enough to have a friend that lives in a NYC luxury condo, now is a great time to take advantage of that communal lounge you’ve been eyeing. It’s a great way to upgrade your neighbor greeting level from a “hi” in the hallway to a full-on chest bump. 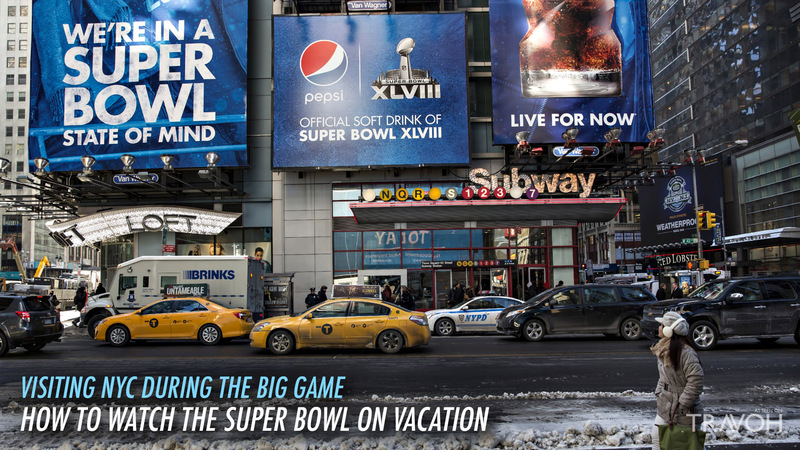 These Super Bowl-watching tips should ensure that you don’t miss a moment of the game while on vacation in New York City. Now if only there was a guide to tell you how much cheese dip is too much cheese dip.